When John Russell gets his well-padded arms and legs moving, he doesn’t so much resemble a goaltender as he does a windmill on blustery day. Pucks so rarely get through Russell’s menagerie of perfectly angled body parts that Breck coach Les Larson can’t recall the senior goaltender’s last shaky outing. They breezed to the Tri-Metro Conference title with a 14-0-0 record to finish seven points ahead of rival Blake, then beat the Bears again, 5-1, to win the Section 2A championship. 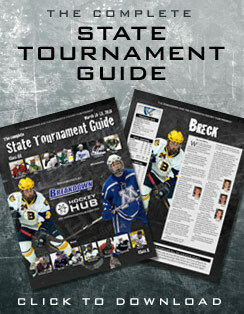 Now comes the state tournament at the Xcel Energy Center in St. Paul, a stage the Mustangs dominated last year. Just two seniors are gone from that powerhouse team. “I think we are a deeper team and a better team,” Larson said about his top-seeded Mustangs, who finished the season ranked No. 1 in the Hockey Hub’s final Class A poll. “Statistically, we are a lot better. Russell allowed one goal in three playoff games and has a 1.43 goals-against average and .934 save percentage in 22 games overall. As great as those numbers are, check out Breck’s offensive totals. The Mustangs were the state’s highest scoring team in the regular season, averaging 7.40 goals per game. They beat their three sectional tournament opponents (St. Louis Park, Orono and Blake) by a combined score of 21-1. Breck senior Mike Morin (33 goals, 28 assists) has committed to Colorado College, and linemate Tyson Fulton (34 goals, 50 assists) took a recruiting visit to Nebraska-Omaha after the Mustangs won the sectional crown. The scoring goes three lines deep and then some. Senior Charlie Borer, a second-line wing, suffered a groin injury in Breck’s opening playoff game. 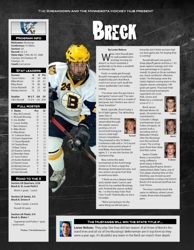 Borer’s replacement, Nate Traina, one of four players sharing time on the third line, was moved up and responded by scoring a hat trick in Breck’s 8-0 sectional semifinal win over Orono. The story is pretty much the same on defense, where Larson rotates three interchangeable pairs.